Luton Town eased past League Two MK Dons in the Checkatrade Trophy group stage last night, as goals from Alan Sheehan, Kazenga LuaLua and Jorge Grant saw them triumph 3-0. Here’s how the Hatters rated on the night. Harry Isted: 8 - Truly breathtaking double save in the second half from Nesbitt. First one was impressive, but the second, somehow managing to react when he looked beaten was just sensational. Confidently came off his line when he needed to as well. James Justin: 8 - Slipped seamlessly into the right back berth and powered forward to support the front men. Sent over one excellent cross that Jarvis just couldn’t convert as he showed just what competition Luton have in the defensive areas. Jack Senior: 8 - Always impresses in this tournament and did so once more. Excellent in possession, gets up and down the pitch well, while never afraid to put his foot in too. Alan Sheehan: 8.5 - Coollness personified as he thumped home his penalty with real ease. Good battle with Aneke in the first half, while after the break, one volley from a corner would have brought the house down. Glen Rea: 8.5 - Dropped back into the centre of defence and put in a strong display, getting his head to things first as Luton always looked solid. Less said about his effort to score a fourth late on the better. Alan McCormack: 8 - His knowledge and experience shone through at times as he made sure his opponents knew they were in a battle. No sign of any rustiness as he lasted the full game, going close at the end too. Arthur Read: 8 - Another young player who is now showing he can handle the level and repaying the faith put in him by Jones. Got about the pitch well, neat and tidy on the ball, unafraid to have a go either. Inches away from a first Town goal, hitting the post and then putting a header wide. Andrew Shinnie: 8 - Quick feet in the box drew one of the most obvious penalties you could wish to see, ensuring Luton got off to a fine start. Good to get virtually 90 minutes under his belt, although should really have got his own name on the scoresheet. Jorge Grant: 8 - Brave header to put the result beyond doubt as he reacted quickest to Jarvis’ shot being saved by Moore. 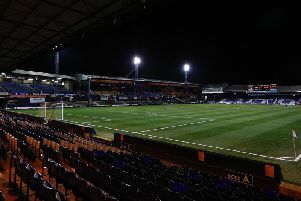 Buzzed around the pitch all night as Luton’s pressing paid dividends. Aaron Jarvis: 8 - Vast improvement continues to show as he led the line well. Won his headers, held the ball up, decent first touch and got stuck in. Seems to have added an extra yard of pace too as he might have added to his Luton tally but for a fine Moore save and recovery tackle. Kazenga LuaLua (STAR MAN): 9 - Was a constant threat from minute one until he was withdrawn late on. Swap in formation meant he could get forward on the left, scoring a great goal when nothing seemed on. Pace and direct approach far too much for the Dons’ back-line. Jake Peck (SUB): 6 - Yet another academy graduate handed his debut by boss Nathan Jones as he came on for the final minutes. Connor Tomlinson (SUB): 6.5 - Great to see him involved once more and a good burst on the left hand side. Josh Neufville (SUB): 6 - On with Tomlinson as the result was done and dusted.